The Tapestry of Time Map for North America shows surface land features and the age and type of bedrock across this continent. The geologic time scale is color coded to the map. There are twenty divisions on this scale within the PreCambrian, Paleozoic, Mesozoic, and Cenozoic Eras. Smaller images of North America span the right hand side of the map showing the location of sedimentary rocks, volcanic rocks, plutonic rocks, and metamorphic rocks. 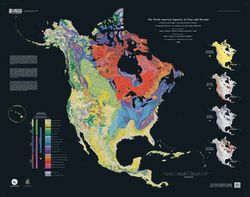 An informative geologic map of North America that also serves as a beautiful wall map!